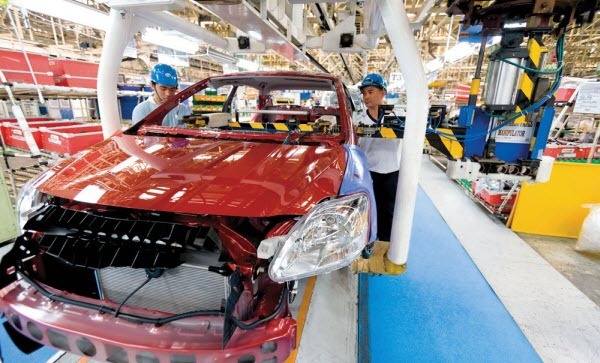 The government’s Comprehensive Automotive Resurgence Strategy (CARS) program will attract more investments and generate business for local parts suppliers, following the approval of Mitsubishi and Toyota, its two main participating car makers (PCMs), the Department of Trade and Industry announced. Mitsubishi Motors Corp. and Toyota Motors Corp., are reported to initially invest Php 7.5 billion to produce the full model change Vios and the Mirage/Mirage G4 in the next six years, totaling to 430,000 car units by the end of the program. Mitsubishi will start manufacturing in 2017. Local parts suppliers are expected to benefit from the investments as 20 percent of the Php 1.6 billion budget will come from their sector. Chemicals, metalworking, tool and die, plastics, electronics, rubber, glass, and textile sectors are also expected to enjoy from the project. DTI estimated that around 14,000 jobs will be generated from the program, with salaries totaling to at least Php 18 billion over a six-year period. The two PCMs are the local car industry’s leading companies. Toyota Motors tallied a 43.32 percent market share in 2015 while Mitsubishi had 18.27 percent. The CARS Program, signed during the Aquino administration, provides Php 27 billion worth of incentives to three car manufacturers who vow to produce 200,000 car units of a single model in a six-year period. It aims to bolster the local vehicle manufacturing sector as it is seen to add Php 300 billion to the domestic economy, according to DTI.